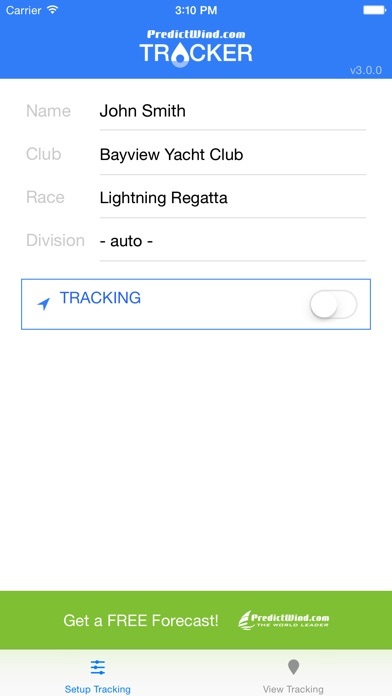 The Yacht Race Tracker App allows competitors to send GPS tracking data, or spectators to watch the yacht race. You can also setup your own personal tracking, and share a web link with friends to watch your progress in real time. Benefits • Friends can watch your progress in real time • Safety - so event organizers can monitor your progress • Replay the race - evaluate your race strategy! Please email us at support@predictwind.com to get your yacht race activated. For installation instructions please visit www.predictwind.com/tracker The data usage for the App is approximately 1 MB for a race day. Continued use of GPS running in the background can dramatically decrease battery life.